Today marks the beginning of the 3rd trimester! We have 12 weeks until Boyshteyn is due! I’ve started having really freaking random dreams. Last night it was that Boyshteyn was born early (like at 5 months) but was fine. In fact, he was talking within a couple of days & came home 3 days after he was born. Biggest problem was when we got home & realized we didn’t have anything ready for him. We quickly assembled all of his furniture & put it in the front yard under the trees. I kept forgetting to change his diapers but Misha & my mom were out there changing them. I then realized that I only have 1 gDiaper and really needed more. For some reason the lack of diapers was stressing me out, not the fact that we were planning on leaving him outside in his crib. What’s new with me? Not much. I’m still nauseous. I threw up today right in front of the entrance to the pedicure place. I almost had a seizure last Saturday, so I’ve increased my Lamictal dose again. Boyshteyn still loves to dance. I think we’ll enter him into a breakdancing contest as soon as we can. My stomach is freaking huge, but two nice people at the hospital today told me that I’m so small for being 6 months. (They were just being nice, but I’ll take it!) 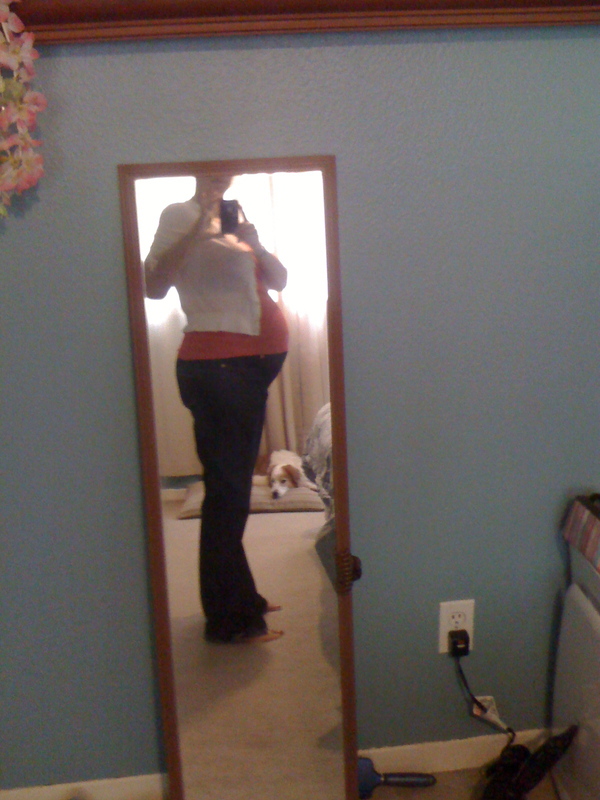 I’m actually going to post a belly picture because I look redonkulous. You’re welcome. This entry was posted in Adventures in pregnancy, Boyshteyn. Bookmark the permalink. 3 Responses to Hello there, week 28! I’ve been trying to pick one based on my knowledge of their prescription history. I don’t want one who cannot write one to save their lives or one who goes to antibiotics for everything. I had an office picked out, but they’re not accepting new patients. Grrrr. Maybe you’ll find a good one while you’re at the hospital. My OB started pushing me to find one at 5 months so I could interview them & would be set up already when Boyshteyn is born. I’m not even the hold up! It’s Misha & his schedule! You are not behind. You actually have a lot of time. At least you realize that now and not when your water breaks. Oh, and I totally had the dream that Andrew was born black and Jeff left me in the delivery room. So random.